New website is aimed at tapping potential for an improvement in relations in a difficult international environment. 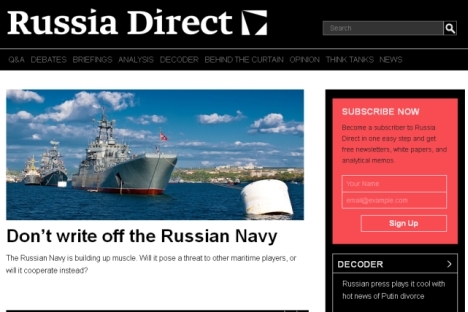 On June 17, Russia Beyond the Headlines and Foreign Policy launched a new digital project called Russia Direct. The new website will bring together articles, white papers and monthly memos on U.S. and Russian foreign policy from leading experts on both sides of the Atlantic. Editor-in-chief Ekaterina Zabrovskaya hopes Russia Direct will allow readers and participants to find new avenues for cooperation following renewed interest in Obama’s reset of relations with Russia amid a prickly diplomatic environment. “The United States and Russia have had a long relationship important to both of these major world powers with impact far beyond just their borders. Take any major international issue and chances are that both Washington and Moscow have a vested interest in it, which sometimes aligns and other times puts these countries at odds with each other,” she said. “That is why today, our team is thrilled by the opportunity to unveil Russia Direct: A publication whose mission is to improve U.S.-Russian relations on the interpersonal, inter-agency and intergovernmental levels,” explained Zabrovskaya. The website will feature over a dozen channels offering various formats of discourse and debate on the present bilateral diplomatic environment. A section titled Decoder examines how current events are covered by both Russian and American media to help readers in both countries understand the others’ perspective. Behind the Curtain offers an insider's perspective on Russian geopolitics. Russia Direct also overviews the most influential think tanks in the United States and Russia. "I think that this and similar projects are important to present a more balanced view on Russia than the most critical one offered by the Western media," said Edward Lozansky, president of the American University in Moscow. "It is in the best interests of both sides of the Atlantic that we have an intelligent and responsible debate which leads to understanding and rapprochement rather than division and demonizing opposite side," he added. "In the age of the Internet, public diplomacy can play an important role and projects such as Russia Direct can be particularly effective." "The United States and Russia share special responsibility for ensuring that the world remains peaceful and prosperous," Lozansky said. "If we can move on beyond the Cold War thinking, establish mutual trust and work together on the range of urgent issues we would set a hugely telling example for others to follow." Readers are invited to subscribe to a weekly newsletter for the latest updates to Russia Direct.